As we settle into our new community, the ebb and flow of daily activities begins to feel more familiar. However, there were certainly some terms, concepts and customs here that I did not understand at all when I first arrived. I thought I would write about them before they become so obvious to me that I can't remember why I found them puzzling in the first place. Please note that the following represents only my understanding of what these things mean. Feel free to correct me if you are a Nunavummiut reading this and snorting a $2.50 can of coke out your nose in laughter. Going out on the Land: Pretty obvious, but this means that someone is going out into the wilderness, often to hunt or fish. This is not the same as someone taking a canoe trip in Algonquin Park. When someone goes out on the land, it's possible that you have absolutely no idea where they are or where to find them. As in, "That TB patient who needs to start treatment and stay in the isolation room? We can't send him down, he's out on the land and we don't know where he is or when he'll be back." Country Food: Food obtained through hunting and fishing. Country food includes caribou, seal, beluga whale, polar bear, arctic char and and walrus. This food is healthy: the meat is generally lean, and the fat consumed from sea life contains omega-3 fatty acids. It is a much better alternative to chips and pop. Here, people use every part of the animal. I have a hard time understanding why some animal rights activists are so against letting the Inuit hunt and kill animals here. This is their tradition and way of life, not to mention their source of (healthier) food! Plus, I have tried some caribou and arctic char and they are delicious. As in, "Country foods are healthier than the McCain Deep n Delicious cake from the Northmart." ?????? : Seatbelt. Why the question marks? Because I doubt there is any Inuktitut word for seatbelt. No one uses them here. In the words of one local, "If the cops see you driving around with a seatbelt on, they'll stop you for sure, because it can only mean that you're trying to avoid getting in trouble for something you're doing." Hmmmm. All I can say is, I always wear my seatbelt when I'm in a car or a cab, because have you seen the potholes on these roads? I'd also be surprised if there were an Inuktitut word for "carseat", because all the babies I've seen being driven around have been in the back of their mothers' amautiit (see below) at the time. As in, "Why would you need a seatbelt in my cab? There are no stoplights here. Plus, I am a good driver, I come from Quebec!" As in, "I smoke about 5 to 6 sticks a day." Water truck: The truck that brings water. Some of the houses here don't have running "town water" and instead have an adjacent water tank which is filled up on a regular basis by the water truck as it makes its rounds through town. The water truck gets refilled at the "Booster Station" where the guy driving the water truck climbs atop the truck, opens the hatch and fills the truck using a giant suspended hose. The water truck can pump 90 gallons of water a minute. As in, "I got stuck behind the water truck on the road to Apex. Man, that was a traffic jam." Amauti: These are one of my favourite things here. 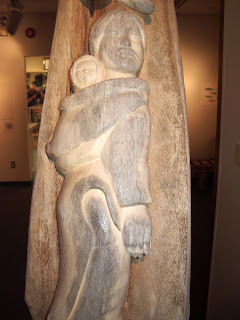 An amauti is a coat or parka with a place for a baby or toddler to stand in at the back. There is a hood that can completely cover the baby and the mom's head, keeping the baby warm. I love seeing babies peeking over their mothers' shoulders while they are in the amauti. To get the baby out of the amauti, I've seen moms bend at the hip and let baby slide out like a seal. The kids seem to love being in there. I'd definitely like to get one of these, but I think I might be considered really kooky wearing one around Vancouver (note: they do have both summer and winter amautiit, so I can definitely get a climate-appropriate one if I want). You never know though, the amauti might catch on in Vancouver and become a trend, although I wouldn't be suprised to see Vancouverites carrying their dogs around instead of babies. As in, "Check out that baby in the amauti. Could these kids be any cuter?" Ii: The Inuktitut word for "yes". Pronounced "Eeeeeeeeeee." This is so much easier than saying "yes" or "I agree." I feel like such a chump for expending all that energy when all along I could have been using a single vowel sound. As in, "Wanna go to wings night on Wednesday?" "Eeeeeeeee." 2438B: Your address. Your entire address. There is no street name, no indicated direction, no cross street. The address, in its zen-like manner, simply "is". This makes things very easy in town, because when someone asks where you live, you quote them a number and they instantly know the exact location of your house. This causes no end of problems when trying to give your address to people outside of Iqaluit. They cannot fathom a place with no street names. Ok, fine, there are street signs, but no one actually looks at them or even knows what's written on them. The only thing they're used for is as a place to lean when you're outside having a smoke. As in, "Hi there (insert name of cab driver), how's it going? I'm heading to 695A. Oh, by the way, did you know your backseat has no seatbelts?" It's busy here in Iqaluit. The hospital is always humming and there is lots of work to do. Even though we are at least as busy as we are at home we've found time to explore, spend time with friends, and even go to the gym (my squash game is slowly improving). Here are a few recent pictures from our summer in the arctic. On a nice day the view over the rooftops and out onto the bay is spectacular. Sunset on the street outside of the hospital. Arctic cotton blowing in the breeze. Rocky landscape at Sylvie Grinnell Park. The waterfall in the park. The best fishing in the area is right below these falls (although I haven't caught anything yet). When I took this picture the fish were jumping and rolling at the surface. Maybe I need a fly rod! A pool of water on the tundra. Sunset on another beautiful day. 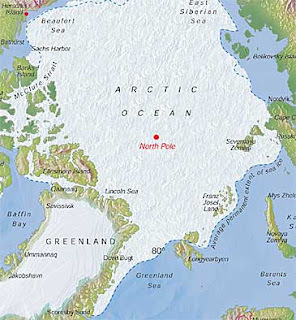 Early Arctic Exploration was driven by the quest for the Northwest Passage, a hypothesized trade route through the arctic that was to link Europe and Asia. Starting in 1576 Martin Frobisher lead 3 expeditions with the explicit goal of finding a passage through or around the top of the North American continent. Passing into a deep inlet on Baffin Island, Frobisher thought he had found the passage. Alas, the inlet was a dead end, but was to bear his name ever after as Frobisher Bay. Although he realized his error as he reached the end of the inlet he was astonished by the gold he found in the area. He filled his ships with the gleaming rocks and returned to England only to find that they were mainly iron pyrite fools gold (later used to pave roads in Kent). After the second world war an airstrip and permanent settlement were developed on Frobisher Bay and given the same name, and the settlement was later renamed Iqaluit. In the 1820's Sir William Edward Parry mounted some of the earliest expeditions to reach the north pole. Using the most advanced technology of the time, the HMS Hecla an early ice breaker that survived several episodes of being trapped in ice, and canned food, a break through in food preservation, Parry managed to reach as far north as 82° 45' N and as far west as 113°46' W.
Perhaps the first ship to navigate the passage was the Octavius, an English trader that had travelled to the Orient and then attempted a return through the passage. The ship was found adrift near Greenland in 1775 with all of the crew aboard but frozen and long dead. The ship had apparently been trapped and drifting, frozen in the arctic ice for 13 years before finally completing the passage. Numerous other expeditions were mounted, most charged with finding a passage for the sake of both exploration and economics. Some of these, such as the overland explorations of John Rae, did serve to map the arctic frontier. Others, such as the Franklin Expedition, ended in disaster. The majority of these early expeditions were undertaken (and funded) with economic purposes in mind. As expedition after expedition failed to achieve success at the passage it became clear that a north-westerly trade route between Europe and Asia, while certainly plausible, was not going to be economical. This subtle shift in thinking actually heralded the arrival of a new type of explorer in the arctic, an explorer who was more concerned with accomplishment, achievement and personal prestige than with national economy. Roald Amundsen finally traversed the northwest passage in his ship Gjøa completing the voyage in 1906 after 3 years. He had wintered his ship at a natural harbour that was populated by local Inuit people (now called Gjoa Haven). While his ship was iced in he spent much of his time learning about survival in the arctic environment, skills that would help him become the first man to achieve the south pole in 1911. From the Inuit he learned how to survive in the arctic, how to wear appropriate clothing, how to navigate on a landscape with few features that did not shift with the winds and the seasons. The quest to reach the north pole was one based more on notoriety than on any solid economics. Located on an ice cap sitting on a sea over 4 km deep, there would be little of value to retrieve from a polar expedition. This was of little concern to the adventurers who tried. Seeking fame (and perhaps the fortune that fame can bring) several men made polar quests between 1900 and 1910. Dr. Fredrick Cook claimed to have reached the pole in 1908 although his claim was not widely accepted (he had also claimed a first ascent on Mount McKinley that is still somewhat controversial, though generally thought to be discredited as fraudulent). The first expedition to reach the pole (and to be commonly accepted to have done so) was lead by Robert Peary who reached the pole on April 6, 1909. Peary's expedition too relied on Inuit guides, Inuit foods and Inuit clothing. Controversy still exists over which of the 2 claims (if any) is credible. In the intervening (almost) century since the last of these exciting events, the arctic has been for the most part a quiet place. Briefly important after the second world war as the USA and USSR aimed missiles at each other across the pole, military installations, radar systems and infrastructure were developed. For the most part however, the arctic has remained little changed, mainly inhabited in the Canadian archipelago by the Inuit, who have lived here for a millennium. Over the last few weeks a great deal of fuss has been made about the idea of arctic sovereignty. Canada believes that the northern archipelago of North America belongs to Canada alone, the US thinks the (potential) northwest passage is an international waterway, and the Russians just sent a submarine to the sea-floor at the north pole to plant a flag, declaring their jurisdiction over the area (as a proposed extension of their continental shelf). The rhetoric is heating up, and fast. Canada's Prime Minister, Stephen Harper, has been touring the north, shaking hands, kissing babies, and making grand announcements. To beef up our claims of sovereignty Canada will be purchasing new armed ice breaking coast guard ships, an arctic deep water port will be built in Nanisivik, and a military training centre will be established in Resolute Bay. Global warming has again opened the door to the economic possibilities that exist here in the arctic. Perhaps a navigable northwest passage will emerge. Perhaps there are resources that can be extracted at a profit. Again great national and economic powers are flexing their muscles and laying claim to territories far removed from their own homes. It is difficult to know how things will evolve, but history tells us that the arctic will not give up it's treasures easily and that great tragedies await those who arrive unprepared or unwilling to listen to those with experience in the north. All of the most successful arctic explorers relied on input from the local people, and learned the techniques of survival that the Inuit had practiced for a thousand years. It will be interesting to see if that sort of collaboration will take place again, or if the imperialism of the nations involved will trump any such efforts. If the latter is the case it may just be that the extreme environments of the arctic sort things out for themselves, again. Mawage. Mawage is what bwings us togever today. Wuv, true wuv that bwessed awangement, that dweam within a dweam. Today is our first wedding anniversary! We've made it a whole year. I am always in awe of people who have stayed married for 20, 30, even 40 years and beyond. To be able to ride the hills and valleys of marriage, and to adapt and change with your spouse takes patience, work and a good sense of humour. So far, this year has been pretty easy, but I'm sure time will not be so kind to us forever, given the likelihood the future will hold challenges far greater than I can imagine right now. And imagine I do. What would happen if one of us got sick (and I mean really sick)? What if one of our (future) kids gets really sick? How stressful will it be to raise even a perfectly healthy child? What if one of us was no longer able to work? What if one of our parents requires a great amount of care in the future? How will we change down the road? Will we still like each other in 10 years? Where will we live? What if the whole world ends up flooded by global warming and our house falls into the sea? It would be an understatement to say that my worries get a bit out of control. I'm sure Aaron would agree- he's heard them all, from the sublime ("Would we go crazy if we won the lottery and had nothing to do anymore?") to the idiotic ("What if my intubating hand gets eaten by a polar bear while we're in the arctic?"). All I know is that I am deeply grateful that we've had one successful year of marriage (and some pretty sweet wedding pictures to go along with it). Some people don't even get that much. We're also lucky that we can spend this year together in Iqaluit practising medicine. Last year, if you had told me I'd be spending the night before our first wedding anniversary doing a general anesthetic for a stat C-section (on my own!!! ), I would have laughed at you. Also, I was too busy worrying about seating arrangements, hairdos and the colour of jam (is it okay if it's light pink? should it be dark pink?). This year is an incredible opportunity to learn together, and from each other. Happy anniversary Aaron, you are a great friend, teacher, and husband. I love you! It's Sunday night, and I'm feeling a little sick to my stomach. Was it the ham and maple baked beans? Some gastro I picked up in the ER? No. It's simply that it's Sunday night, and I have to go to work tomorrow. I don't know why I get this way, but I can tell you, it's nothing new. I remember feeling like this as a little kid. We'd be driving back from yet another Sunday dinner at my grandparents' house, and I'd be strapped into the back seat, staring out into the dark, listening to 80's ballads playing on the radio. As much as I love the song now, I still get a bit nauseated when I hear "Don't Dream It's Over" by Crowded House. Sunday night would trigger an increased heart rate, a drop in the pit of the stomach... because I had to go back to school the next day. The weekend fun was over, the drudgery of math class, piano lessons and homework was beginning anew. And I was someone who liked school (and did well in math class). Can't say I ever liked those piano lessons, but that's a whole other topic. But I'm an adult now, with the freedom to make my own decisions about what to do with my time, with (finally) a real job, and without 4 pages of times-tables to complete before tomorrow. Yet every Sunday, it feels exactly like I'm heading back to roll call the next morning, and I dread the hours before the weekday starts. I find it curious that I hate Sunday night so much, because there are a whole bunch of reasons I could choose to like it. For one, it signals the start of a new week. The troubles of the previous week are left behind (well, except all the lab reports generated from previous office visits). Patient yelled at me? Whatever! Drunk guy tried to spit in my face? OK. Hypotensive patient tried to die in the OR? So last Wednesday. Counter to this dislike of Sunday night is the fact that it should be the best part of the weekend. The grocery shopping has been done, the gym has been visited, the weekend plans completed. Time to sit back and relax. Time to watch the Magical World of Disney or Desperate Housewives. By spending the night worrying, I'm cheating myself out of some quality down time. However, the most compelling reason for me to start liking Sunday night is that I'm worrying for nothing. It takes all of 3 minutes for me to get settled back into work Monday morning. If I'm doing clinic, I grab a cup of coffee, sit at my desk and flip through those lab reports, and think to myself, "This really isn't so bad after all." I think it's time to take back Sunday night. I'm going to go make some hot chocolate and watch a re-run of Desperate Housewives (yes, we do have cable in Iqaluit) and enjoy the simple fact that I have a tomorrow to look forward to. And no math homework. Do you live in a city? Can't imagine being more than 4 blocks from Starbucks? Need to be able to get to a yoga class 5 days a week, and replinish the wardrobe of LuluLemon outfits frequently? Do you like to watch foreign cinema, or go to the ballet on a regular basis? Do you enjoy dining at a multitude of different resturants on a regular basis? If you answered yes yes yes yes and yes you're probably an entrenched urbanite, and probably get a bit uncomfortable if you roam outside of the city (Where are the highrises, the people? Where can I get a venti half-caf mocha with a pinch of cinnamon, hold the foam?!). Many people who live in cities find it difficult to fathom how people who live in smaller places do it. What is there to do? How do you meet people? Where do you get a coffee??? If you are really an urbanite this is an important question, and you probably shouldn't get out of range of the hum of a city. However, if, like most people in cities, you're more city-dweller than an actual urbanite, it's a question worth considering. Dr. H. and I lived in Vancouver for the past 2 years, and like most people we were more city-dwellers than urbanites. While we enjoyed Vancouver as a city (it's a nice place! ), we didn't really take advantage of it in the urbanite sense. We shopped at the grocery store near our house, ate at the resturants near our house, got our take out from our regular places (mmmm Banana Leaf), and never (not even once) managed to go to a ballet. The difference here is crucial. A true urbanite, a trendster in clothes that are so cool the average person can't even figure out that they are cool, with a tall-exotic caffinated energy infused beverage in hand can't be removed from the city. Open land is to urbanites as holy water is to vampires. But city-dwellers are a different story. While city dwellers may not have experience living outside of the city, it's an experience they might actually enjoy. Iqaluit is a small place. It only has a few stores, a few resturants, one movie theatre, and far less than 1% of the population of greater Vancouver. On the surface it seems there is far less to do, far fewer people to meet and that it might be a boring place. A closer look shows that it's actually not true. Iqaluit, and many other small spots, have just as many grocery stores and resturants, and movie theatres as we frequented in Vancouver. It's also a very social place. In Vancouver I could wander around for days and never run into anyone I knew. 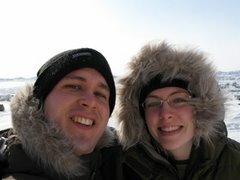 In Iqaluit I see someone I know every time I go anywhere, and usually get introduced to whoever they are with. It's easy to meet people here, and very social. In the 2 weeks we've been here so far we've probably gone to as many dinners with friends, potlucks, and other social gatherings as we did in the last 6 months in Vancouver. Sure, there are some downsides to small towns: less privacy, and craving for a Tim Horton's coffee chief among them, but overall it's a nice change. We're enjoying it a lot, and would recomend that anyone who's living in the city but contemplating something different to give it a try. Change is invigorating!